The latest data from Kantar Worldpanel, for the 12 weeks ending 5 July, showed a brighter picture for the physical entertainment market as several key retailers grew in value on last year and the rate of decline slowed to 3%. Tesco, Amazon, GAME and Argos all saw an increase in sales, between them bringing an additional £8.5 million to the market. According to Fiona Keenan, strategic insight director at Kantar Worldpanel, the physical entertainment market's decline of 3% year-on-year is a positive sign – last year growth was down by 7% in the second quarter. Games have been the strongest performer over the last quarter, supported by sales growth in software for the current generation of consoles. Performing particularly well is GAME, which has increased its market share within the sector to 31.7% from 29.1% last year. It continues to be the preferred choice for owners of the Xbox One and PS4, taking 36.5% of their combined software sales. "There's been an improved performance in the video market, where a value decline of 3.6% compares to a drop of 9.5% last quarter," Keenan says. "Amazon and Tesco were the major winners, taking 42.5% of the market between them. Tesco was also the strongest performer for the period's biggest release – The Hobbit: The Battle of the Five Armies – securing over a quarter of the title's physical sales. The two retailers are now clearly ahead of HMV despite the three being level this time last year. Meanwhile Asda saw the largest decline in the video market. 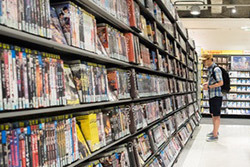 Its market share fell from 15% to 11.7% year-on-year, following a move to a £11 price point on new release DVDs as many of its shoppers switched to other, cheaper retailers." Despite a strong growth in the first quarter of the year, physical music declined in the second quarter of 2015. This was particularly felt by the grocers and Asda, Morrisons and Sainsbury's collectively lost over £3 million in value year-on-year, due in part to a lack of big-name album releases to match Coldplay's Ghost Stories, which came out in May 2014. While HMV saw declines across both video and gaming, it held its value for physical music, helped by new releases including English Graffiti by The Vaccines and How Big, How Blue, How Beautiful, the third album from Florence and the Machine. With the re-launch of its online store in June 2015, HMV now has access to the 3.8 million shoppers who purchased physical music and video in this way in the last quarter, which should improve its performance. The importance of smaller retailers to the physical entertainment market continues to grow, with their contribution worth £47.7 million – up by £4.3 million from last year. Grainger Games has benefitted from the strong results for games with its share in the sector up to 2.6% from 1% last year, while Zavvi's share of online physical entertainment spend has increased from 3% to 3.5% thanks to the continued growth of the online market, which now stands at 34.7%.